We love working with Sandstone, it’s very satisfying as we usually get called in when it looks really horrible and grubby and after some work it ends up looking stunning. 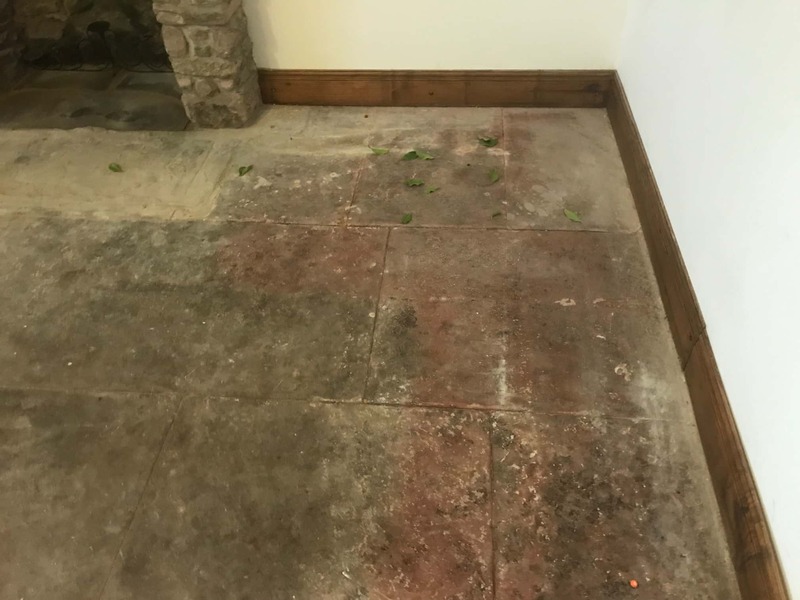 The floor in this property in the famous Lake District town of Keswick had been covered with carpet for many years, so when we uncovered it as you can see from the pictures, it was clearly in needed of major attention and a great candidate for restoration. 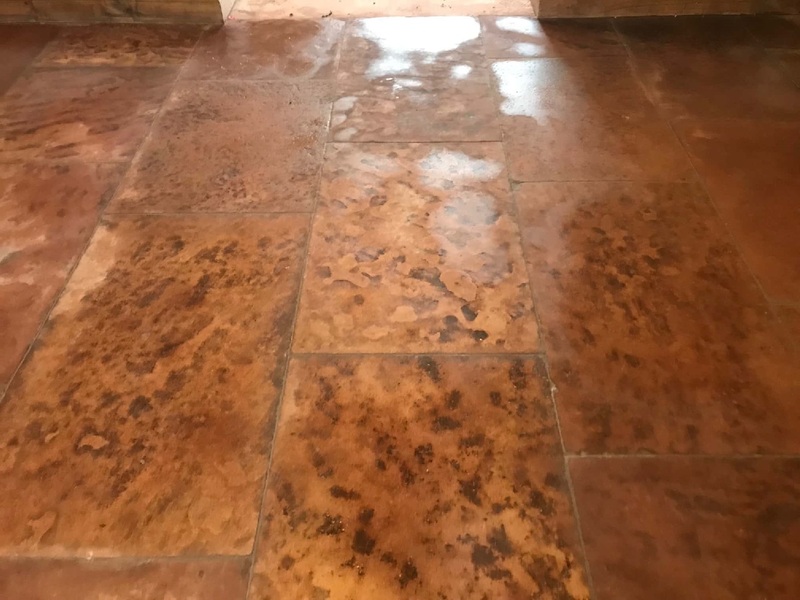 When the floors this bad there’s no point trying to get a decent clean just by using chemicals alone, so we often offer a system we have perfected at Tile Doctor called “Milling”. We discussed the project in detail with the client and agreed a price and a time to complete the work. Milling involves the application of several coarse grades of hard diamond pads to the stone using water to lubricate the process, the water also helps make the removal of the soil easier and reduces dust. On this occasion we used coarse 50, 100 and 200-grit milling pads applied in sequence with a weighted rotary floor machine, the floor is rinsed with water between each pad and the soil extracted using a wet vacuum. We worked our way across the floor using this process. Not only does this give the stone the deepest clean it has ever had but it also cuts back the stone a few millimetres and takes off a lot of roughness leaving the finish a lot smoother, this makes the now Milled Stone a lot easier to maintain in the future as it has a much smoother texture and finish. 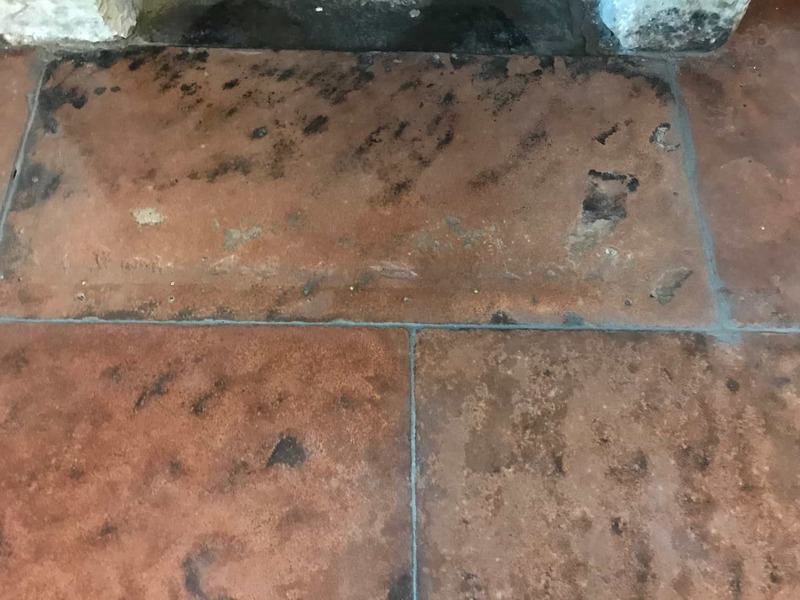 Loose grout is a common problem on these older floors, so the next step was to rake out any broken and loose grout between the slabs, clean-up and repoint to match the existing. Once that had set, we gave the floor another lighter clean with Tile Doctor Pro-Clean run along the recessed grout lines with a rush to clean them up. I was then satisfied the floor was a clean and it could be, the floor now needed to dry our before we applied the sealer. 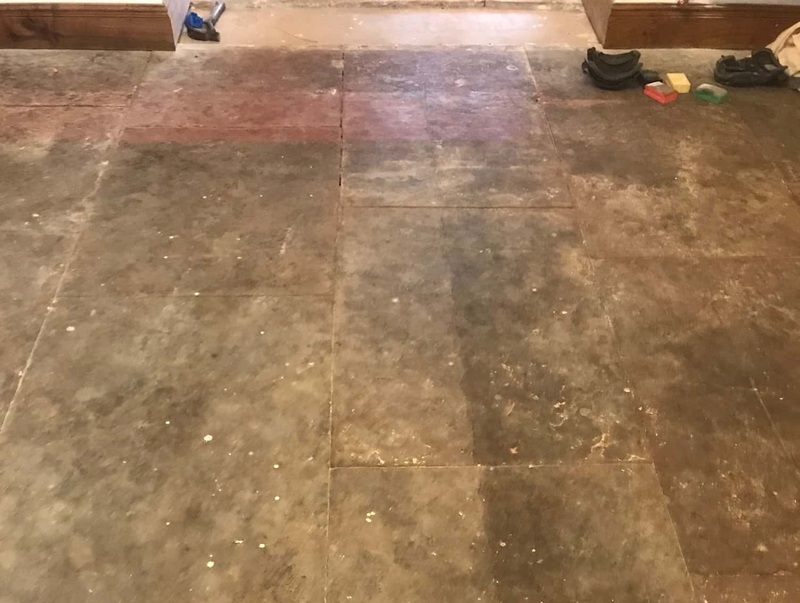 We returned the following day and checked the floor was dry using the moisture meter, we don’t recommend applying a sealer to a damp floor as the sealer will not cure properly. 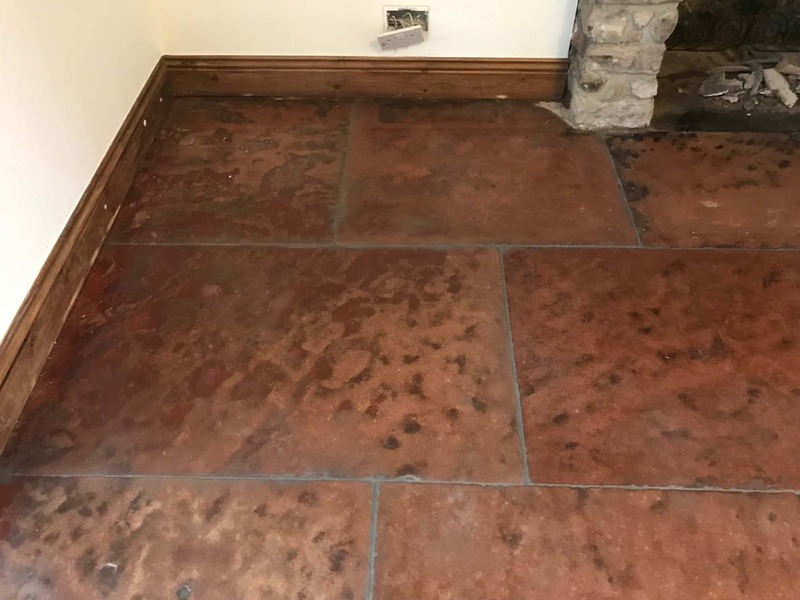 All was well, so we then applied several coats of Tile Doctor Colour Grow Sealer, this is a fully breathable, impregnating sealer that will protect the stone from staining whilst enhancing the natural red colour in the Sandstone. 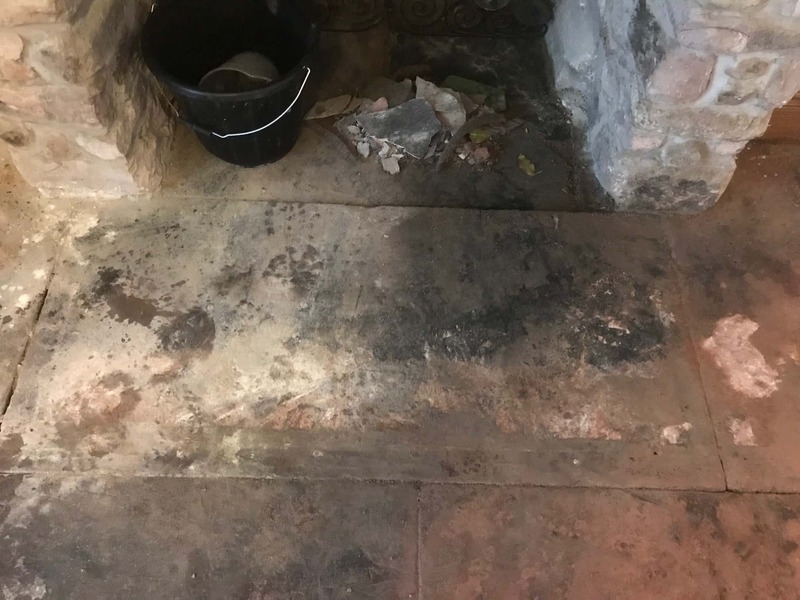 Using a breathable sealer on old stone floors like this is highly recommend as these floors rarely have a damp proof membrane installed and so it’s important to give moisture a way of rising through the floor naturally and evaporating rather than being trapped under the floor where it can eventually build up in the walls. As you can imagine from the after pictures the customer was happy with the overall outcome and relieved that their decision to remove the carpet had worked out.